Cynarra Potocki has always been interested in complementary health care, which lead her to complete Lambton College’s two year Massage Therapy Program in 2016. Shortly after graduating, she passed her registration exams to become a Registered Massage Therapist (RMT). Cynarra began her career as an RMT working at the London Massage Therapy Centre, where she provided care for musculoskeletal conditions that resulted from work related stress, injury, and other medical conditions. Cynarra is fully trained and qualified to perform general Swedish massage, trigger point therapy, joint mobilizations, prenatal massage, myofascial release, therapeutic stretching, and to recommend self-care strategies. Before beginning your treatment, Cynarra will conduct a brief assessment to help pinpoint the source of your pain or discomfort. Following this, she will discuss your treatment goals and develop a personalized treatment plan with you. Outside of work, Cynarra enjoys spending time with family and friends, sailing, walking her two golden retrievers, travelling, and researching. She is passionate about furthering her education and intends on expanding her knowledge of myofascial release techniques, physical assessments, acupuncture, pregnancy massage, and pain science. 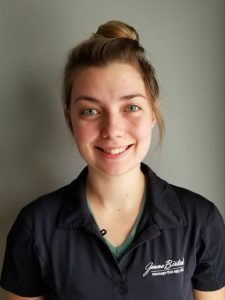 Along with her fellow colleagues at Jenna Birtch Massage at 930 Waterloo Street in London, Cynarra will strive to meet your treatment goals with care and professionalism. Cynarra is a member and in good standing with both the College of Massage Therapists of Ontario (CMTO) and the Registered Massage Therapists of Ontario (RMTAO).